PEORIA, Ariz. — The offseason, for No. 1 Padres prospect Fernando Tatis Jr., lasted all of two weeks. 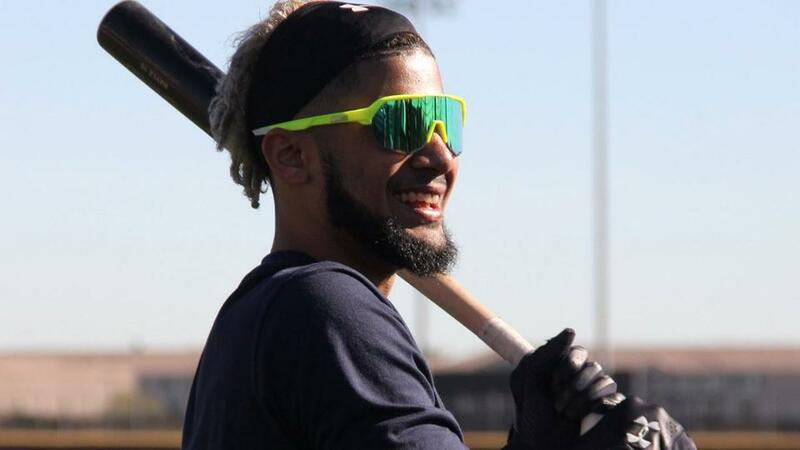 “Good to be young,” quipped the 20-year-old shortstop from the clubhouse at the team’s Spring Training complex on Wednesday. Tatis, ranked No. 2 among MLB Pipeline’s Top 100 Prospects, arrived at Padres camp last week, after spending nearly the entire winter playing for Estrellas de Oriente in the Dominican Republic. In his hometown of San Pedro de Macoris, Tatis helped lead Estrellas to their first championship in more than half a century. He batted .263/.379/.488 with three homers during the regular season. Then he homered three more times — including a walk-off shot (and a demonstrative bat flip) — in the playoffs. In more ways than one, it was an incredibly worthwhile experience for Tatis, whose father served as manager of the team. The young shortstop made up for the time he lost last summer when he missed the second half of the Double-A season with a broken bone in his left thumb. That was his goal last year, too, but this time it feels different. “He’s got every opportunity to force our hand by the way he plays,” said Green. It still seems unlikely. Tatis has yet to receive a full season’s worth of at-bats at Double-A. Service time considerations might also come into play. If the Padres wait a few weeks to promote Tatis, they’d gain an extra year of team control at the end of his rookie contract. But that’s a debate for another day. For now, Tatis is in camp, determined to prove his worthiness for the Opening Day roster. He’s also determined to disprove the notion that his strong 6-foot-3 frame might be better suited for an eventual move to third base. To some extent, Tatis has already done that. Scouts have marveled at his ability to handle the position, and the Padres remain as committed to Tatis at short as they ever have. “Maybe in 12 years I’ll move to third,” a gamesome Tatis said, as he broke into a wide smile. Luis Urias — Tatis’ presumed long-term middle-infield partner — will play shortstop primarily during the early stages of Spring Training. Urias debuted last season and played second base exclusively with the big league club, though he’s split time relatively evenly between second and short in the Minors. Urias is the projected stopgap at shortstop while the Padres wait on Tatis’ arrival. With the December addition of second baseman Ian Kinsler, there’s an obvious path to playing time for Urias at short. “He’s definitely one of our leading contenders to be at that spot at the start of his season,” Green said, adding that Urias has entirely recovered from the left hamstring strain that sidelined him in September. Right fielder Franmil Reyes has recovered from offseason surgery on a torn meniscus in his right knee. He was in Padres camp on Wednesday and has been fully cleared for workouts, though the club might take things slowly with the hulking 23-year-old. Reyes was the Padres’ best hitter in the second half last season, and he finished his rookie year with a .280/.340/.498 slash line and 16 home runs in 87 games. He’s set for a fierce spring competition for corner-outfield spots — a competition that also features Wil Myers, Hunter Renfroe and Franchy Cordero. Will NASCAR’s new rules hinder Kyle Larson?